Why a triangle? why youth? why media? why schools? Part of the understanding of what is happening now comes from knowing what happened before. Young Journalists look deep into the past in the ruins of Beit Jubrin / Bet Govrin. Windows is unique in its structure, as an organization comprised of Palestinians from both sides of the Green Line and Israeli Jews, on all levels of the organization, from members and board of directors, through the staff to the participants. But Windows did not begin that way. The organization was established by Palestinian and Jewish citizens of Israel, and so was the first youth editorial board. When youth from the Occupied Palestinian Territories soon joined, we faced yet another challenge: do the Palestinian citizens of Israel belong with the OPT Palestinians or with the Israeli groups? Both the understanding that they live in different realities and the physical separation led to the development of this structure. Since then, Windows activities are designed, developed and propelled by and for members of these three communities, thus ensuring equal representation of the voices and needs of each. We believe that in order to achieve full understanding of our reality and to find a just and viable solution for all of us, it is necessary to include all three communities in the search and development of solutions. Windows program offers space for each group of the three to explore their own identity and story, values and needs before sharing with the other groups, to discover shared values, develop a wide perspective and becoming a task group ready to work towards a just solution. During the 90s, two editorial boards were active. One in Tel Aviv-Jaffa where youth from both parts of the city (Arab Palestinian and Jewish) met and worked together, facilitated by the two editors of the magazine - one Muslim and one Jewish. The other editorial board was active in Gaza, facilitated by local youth workers that were guided by the Muslim co-editor. The emphasis of the program was mostly on journalism and media, and the emotional process slowly developed as the euphoria of the Oslo agreements subsided and harsh realities became more evident in the content of the magazine. 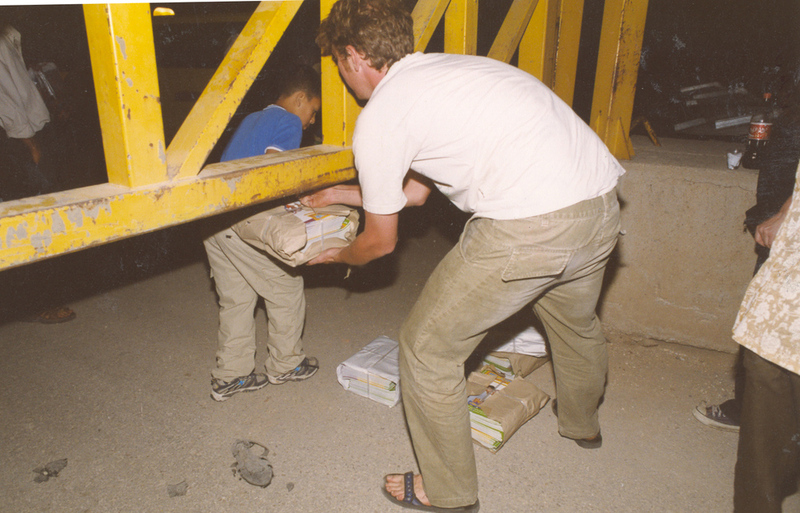 The second Intifada began in the end of September 2000, and with it the tensions between Palestinian and Israeli citizens of Israel intensified as well, creating new challenges for us. There was a need to offer the groups from Tel Aviv and Jaffa an occasional separate safe space to share and process feelings they were not ready to share with the Jewish group. By that time, the editorial group in Gaza was replaced by a group in Nablus, and later on with a group in Tulkarm, both in the West Bank. Communication could be maintained through emails, but meetings face to face were not possible until 2003 due to lack of entry permits for Palestinians from the OPT into Israel. This, however, posed not only the difficulty to bring the separate Palestinian groups together and give each its own place - it was also the understanding that while they share the same historical conflict with the Israeli Jews, after 1948 each group has its own conflict with them. They live a different reality and face different challenges that often lead to tensions between the two Palestinian groups. The team could see the advantages of having a facilitator from the same community as the group, one who would fully understand the experiences of its members. Youth grow up to be adults who educate their own children and lead their communities. Their views and perceptions, including those of themselves, the 'other' and the conflict are gradually consolidated as they grow up, based on their education, personal experiences and the information to which they are exposed. As elsewhere, everywhere, through media and education, the leading powers of each society create the public opinions they believe serve the benefit of their society, or of the leaders, and they are often not the same. Windows aim to offer youth alternative sources of information, created by youth their own age from both sides of the conflict, hoping to enable them to grow up with wider, more accurate views that will encourage them to work towards a better future for all. Windows was taking its first steps in alternative education more than 20 years ago. At the time, we could see the importance for Arab and Jewish youth in Israel to grow up knowing each other, learning from each other about the complexities of Israeli society and accepting each other as equals. We saw it as a preparation to work for and lead a society based on equality and justice. As soon as youth from the Palestinian Occupied Territories joined the editorial board, the goal expanded to enable youth to deal with the reality of the occupation and its impact on the possibilities of a peaceful future. We encouraged them to study it and raise awareness of this reality among their friends, realizing that, often, also Palestinians who grow up in Israel know very little about the other side of the Green Line. We saw them all as peace builders who serve as role models in their respective societies for the needed efforts towards just peace. As the years went by, and the world gradually became the "global village" it is now, we witnessed a growing awareness of whatever is happening worldwide thanks to social media. It seems that more than ever before, youth can be heard, locally and internationally, and use their original voices to impact the changing societies. Youth worldwide are becoming part of an international movement for social justice and international responsibility. Windows youth learn to see themselves as part of this movement. As the media have a huge impact on the way people feel and think, there has always been a need for alternative media to counter the mainstream media that often has other interests than the public’s right to accurate and comprehensive information. When Windows’ Hebrew-Arabic Magazine appeared in the mid-90s alternative media were not as common as they are today. For many, Windows was the only source of information about 'the other side'. The printed version such as we produced for many years, or the newly produced on-line blog, can reach tens-of-thousands of readers. It can be distributed to youth who may not have any other opportunity to learn about or meet 'the other'. Published in both Hebrew and Arabic the magazine solves problems created by the language barrier. In general, a magazine is less intimidating than a personal meeting for those who may be afraid or reluctant to meet each other. Feelings, thoughts and opinions are shared with the safety of one's own community, giving time to think of what one wants to write and express. This can serve as a preparation for joint meetings of Windows and other organizations, as well as a continuation of discussion when the framework of meeting is over. In the classroom, the magazine was used as learning material to expose students to voices from the other side of the conflict, which was rarely part of any other traditional learning material used in schools on either side of the Green Line.